Over and against a simple VoIP gateway, another benefit with a VoIP router is this: a VoIP router can provide PSTN fallback with voice-and-data survivability for business continuity in the event of an Internet or IP network failure. While most networks today employ session initiation protocol (SIP) for voice encoding, the earlier standard, H.323 is still in use. The best high-quality VoIP routers are able to support both protocols, both of which are encapsulated in the data payload of the real-time protocol (RTP) protocol data unit (PDU). Another benefit of the VoIP router is the capability to provide quality of service (QoS) mechanisms, especially in the downstream path. For details on this feature, see Addressing QoS Beyond the Provider Network. VoIP router can be used to address many different challenges when implementing an IP-based voice system. Two of the most common use cases are described below. Router The SmartNode VoIP Router is a high-quality, enterprise-class solution that offers All-IP network access with QoS voice and wire-speed traffic shaping. Providing dual 10/100 Ethernet ports, the SmartNode VoIP Router connects your phones and computer hosts to your LAN with VLAN tagging, DHCP server/client, and firewall/ACL services. Employing PPPoE and IPSEC VPN with DES, 3DES, and AES strong encryption, the SmartNode VoIP router carries all your voice and data streams to the WAN over a single, secure network connection. Using Patton's SmartNode VoIP gateway routers with FXS & FXO ports provides seamless access to remote packet-voice and local PSTN telephony. Using powerful call-switching technology, distinctive ring, and caller-ID, a single handset can reach the right phone service at any time. With Patton's ClearConnect™ fail-over protection your phone call is sure to be completed. Network health-monitoring and IP telephony switching ensures a clear call-even if the IP network is down. 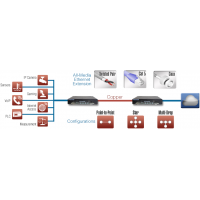 Ethernet extenders allow network designers to extend Ethernet connections well beyond the standard 3.. The Global Leader in Secured Digital Communications Trusted by leaders in: Defense & Intel..
Why use Patton Electronics OnSite IPLink Series Routers?Patton's IPLink Gat..